Eugene, Ore. - 2018/2019 marks The Very Little Theatre&apos;s 90th year of being a cornerstone for the performing arts in Eugene! 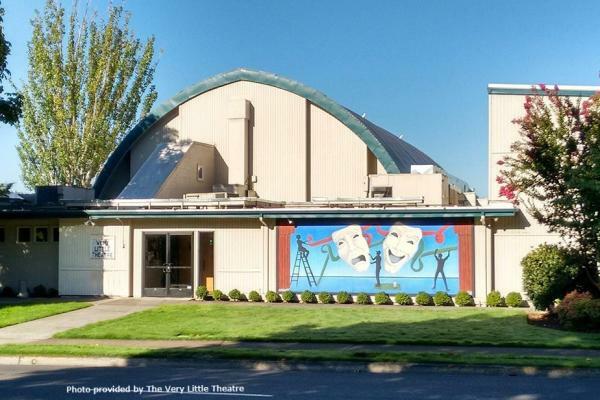 The Very Little Theatre is the oldest continuously running community theater in the Pacific Northwest. Run mostly by volunteers, the Very Little Theatre is a true community theater; welcoming all to participate no matter level of experience or background! Season passes are available for this historic 90th season. The coming season is family-friendly and begins in October with Steven Dietz&apos; Dracula. Dracula by Steven Dietz, directed by Stanley Coleman; running Octocter 26 - November 10, 2018. Dracula, the name alone conjures dozens of images and ideas. Rich with both humor and horror, this play paints a vividly theatrical picture of Bram Stoker’s famous vampire. The Long Christmas Dinner by Thornton Wilder, directed by Rebecca Lowe; running November 30 - December 16, 2018. This play breaks the boundaries of time as generations of the Bayard family come together to share Christmas dinner. Blithe Spirit by Noel Coward, directed by Karen Scheeland; running January 5, 2018 - February 9, 2019. A drawing room comedy about what happens when a writer, Charles Condine, his wife, their friends and a medium, Madame Arcati come together for an evening séance. Hello, Dolly! by Michael Stewart and Jerry Herman, directed by Gerald Walters; running March 29 - April 13, 2019. The musical tale of matchmaker Dolly Levi and her designs to bring the best match to all who meet her. Proof by David Auburn, directed by Larry Fried; running April 26 - May 5, 2019. Proof is a Pulitzer and Tony award-winning play that looks at family and the line between genius and insanity. The Game&apos;s Afoot by Ken Ludwig, directed by Chris Pinto; running June 7 - Jun 22, 2019. The Game&apos;s Afoot combines drawing room comedy, mystery and Sherlock Holmes. Harvey by Mary Chase, directed by Kari Boldon Welch; running August 9 - August 24, 2019. Harvey presents an incredible combination of kindness, mysticism, and commentary on the distinctiveness of the individual in society. Additionally, Minority Voices Theatre at The Very Little Theatre will present Pilgrims Musa and Sheri in the New World by Yussef El Guindi, directed by Michael Malek Najjar; running February 15 - March 2, 2019. This charming and revealing play takes a typical love triangle and infuses it with the tensions of the east/west cultural divide. More Ticket Information: Season Pass purchases can be made online at thevlt.com, by phone, 541.344.7751 or at the VLT box office at 2350 Hilyard Street, Eugene. Box office hours are Wednesday-Saturday 1:30-5:30 p.m.